Yesterday's post was about my favorite book from the library run we made that day. However, I haven't done a library run down post in awhile (where I list every single book we got and give a little blurb about what I like or don't like about it), so I thought I'd take the time to do that today for the other six books we brought home. I give Coryn most of the decision making power when picking out picture books. Sometimes I'll veto a choice (if I think elements in it are too scary or if it is one of those books that just retells the stories in her cartoons, I hate that. I also reserve the right to turn down books for questionably moral material, but fortunately that hasn't come up yet. Screen before you read aloud, folks. Book companies make questionable decisions and librarians aren't there to raise your children for you.) but mostly she'll bring me books, I'll glance them over and put whatever she wants in the "take home pile." I link back to amazon for these books in case you are intrigued enough that you want to buy or wishlist them. 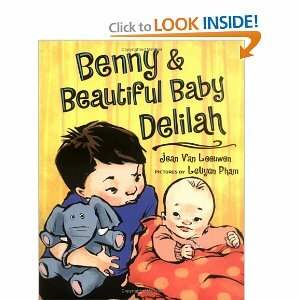 Benny & Beautiful Baby Delilah: I've read this book before. . .not this particular book, but books so like it that it might as well be this book. The "new sibling" story is a classic. The plot always goes something like this: kid is blindsided by new baby, new baby disrupts everything so kid does not like the new baby, then new baby does something (usually smile or laugh at the kid when no one else can get the baby to be happy) that endears the baby to the kid and all is happy with the world. Some of these stories have something particularly endearing about them or original, but for the most part, they are a basic staple of kids literature sort of like how buttered noodles are a part of most toddler diets. This one has high points of bright and fun illustrations and a believable child (though he can be a little bratty at times) but unless this is the only "new baby" book you can find at your library, there is nothing to make it extraordinary. Here is a post in which I list some similar books that I actually like better: Baby Homework. In the Rain with Baby Duck is actually one I might choose to get again. 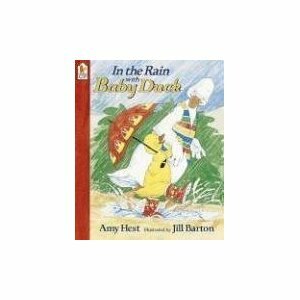 It is a story of a sulky little duck (there were a lot of somewhat bratty characters in our books this week, but all kids have their moments, I guess) and how she learns to like the rain due to some gentle urging by her beloved grandfather. I found it fun to read because of the "pit-a-pat" rain sounds and the way that Baby herself talks. She had a voice that was fun to narrate. The illustrations are nice, but Coryn insists that baby ducks parents are, in fact, geese. I'm not sure what she thinks the difference is between a duck and a goose, though. 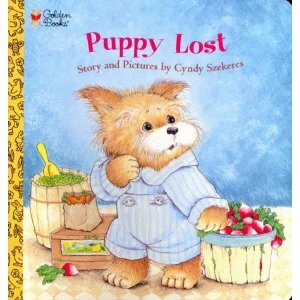 The next book Puppy Lost is maybe out of print because I couldn't find a copy on amazon with the same cover as the copy we picked up. It's another basic story about a puppy who gets separated from his mommy in a grocery store. I wouldn't call it an instructional book, it doesn't give a ton of good advice for lost kids (at least none that the puppy actually follows) but it is something kids might experience and can relate to and the puppy illustrations are cute. 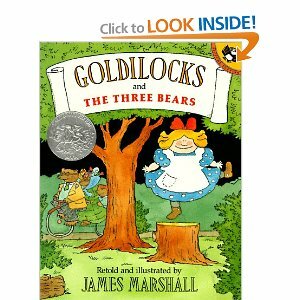 There are a lot of versions of Goldilocks and the Three Bears. We actually own two of them already, which is why I was surprised when Coryn brought me this one by James Marshall. However, it is a Caldecott Honor book and the pictures are fun, so we brought it home. However, I still like the Paul Galdone version better (nice illustrations and the telling is more the classic, repetitive style I associate with good fairy tales). 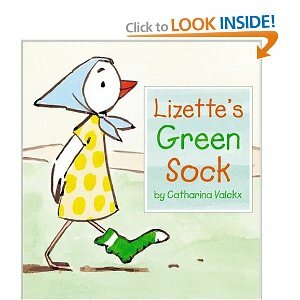 Lizette's Green Sock was another nice find. It has simple illustrations and a cute story about a young duck who is happy to have found a single, green sock and how she chooses to share rather than have a full pair. It is creative and cute and the characters are good examples except for the bad "bully cats" who try to ruin Lizette's day and be little her find. And finally, Woodpecker Forest, a nature story with beautiful wood cut illustrations, I wasn't sure Coryn would actually like this book because it is slow paced and the colors aren't as bright as she usually prefers, but we've read it twice now and it seems to keep her attention. 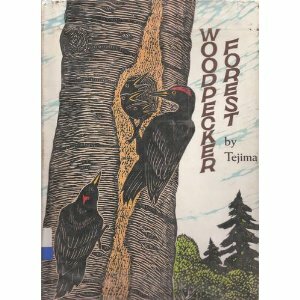 Also, it is a nature story and somewhat informative, telling how woodpeckers live and how their young leave the nest when they get older. New books are always fun to read. I like to try and find something new every time we hit the library. I hope you do as well. Kids need to grow up surrounded by books.